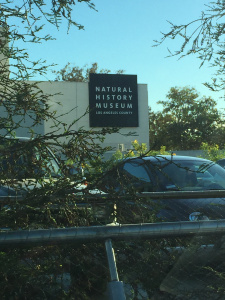 From 9 – 13 November 2015, Ian traveled to San Francisco and Los Angeles, to sample sea stars in the echinoderm collections at the California Academy of Sciences and the Museum of Natural History, respectively. Museums represent hugely important tools for understanding past ecological phenomena, morphology and evolution, and even chemical composition (amongst many other uses). 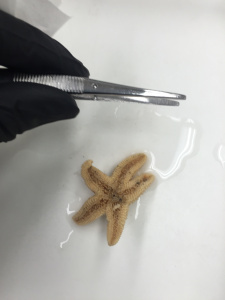 In our case, the collections can be used to look at the presence and genomic composition of the Sea Star associated DensoVirus (SSaDV) over time. While there have been numerous studies examining pathogens in preserved vertebrate species, there have been very few (if any) looking at viral infection in invertebrates. Our previous work in 2014 highlighted the presence of SSaDV in samples from 1942, meaning it’s been around for far longer than the current disease epidemic. 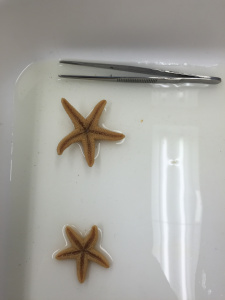 As part of our new sea star project, we will examine the genomic diversity of SSaDV through space and time, in order to understand whether it has changed recently or perhaps provide other clues as to why it is currently associated with the disease. The actual sampling involves locating specimens (which is done with the large assistance of museum staff and curators – Rich Mooi, Chrissy Piotrowsi and Bekky Markado at the CAS, and Gordon Hendler and Cathy Groves at the MNH – and identifying their contents. 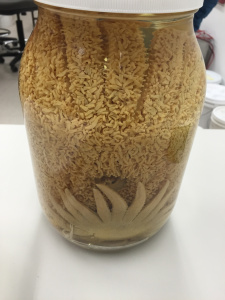 The documentation of these samples is a meticulous process which involves complete phylogenetic ID (much of which is done by people like Chris Mah at the Smithsonian), cataloging them, and of course their preservation. It is standard practice in the TAV to photograph each sample used for our research, which in this case is useful to document potentially ambiguous species. We then remove the specimen using tongs and clip 5 – 10 tube feet randomly, which are then placed into sterile tubes for transport. 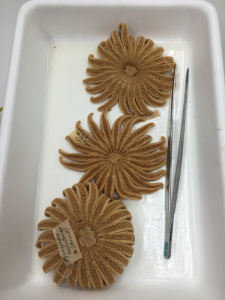 Ian sampled a total of 75 specimens during the expedition, which means we now have 141 historical samples with which to work (including those sampled in 2014). The next step will be to extract DNA from these and subject them to qPCR, which will highlight animals where SSaDV is present. We will then fully sequence SSaDV genomes from these samples and compare them by alignment.